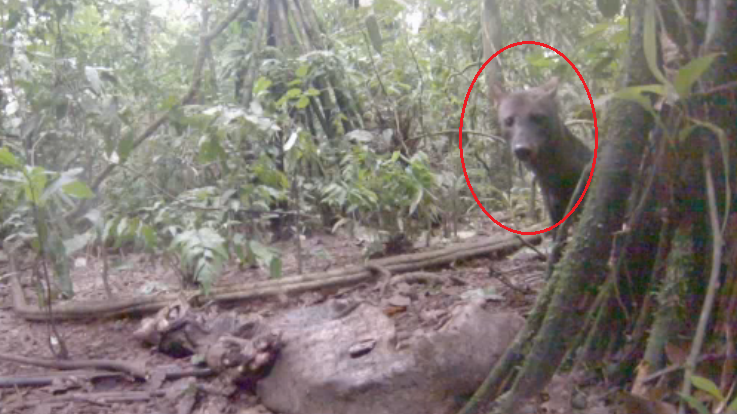 A conservation biologist stationed in southeastern Peru was able to capture on video the rare and very elusive short-eared dog (Atelocynus microtis). Endemic to the Amazon basin, very little is known about the animal which has been categorized as a near-threatened species by the International Union for Conservation of Nature (IUCN). The conservation biologist Larry Reeves captured the video back in May at the Tambopata Research Center in Peru. Reeves wasn't particularly planning on filming short-eared dogs when he set up a GoPro camera pointed at a peccary carcass at a trail near the research center. Reviewing the footage later, Reeves was very surprised to see the elusive dog appear in the frame. "The dog came by about 20 minutes after we left. That was crazy." Reeves told the National Geographic. In the video, the jungle dog can be seen approaching and smelling the peccary only to back away after sensing the presence of the camera. Watch the video at the National Geographic website. Not much is known about the short-eared dog's biology and ecology. However, species' existence is being threatened mainly by the degradation of their natural habitats and contact with feral dogs as feral dogs can facilitate the transfer and spread of diseases. Short-eared dogs are mainly carnivores but they have also been observed to eat fruits. Some photographs taken by the Amazon Conservation association show the dogs munching on fruits. Screen capture from a National Geographic video.